Originating from imported USA sled type dogs and mixed with Siberian Husky, Alaskan Malamute and German Shepherd, they then were exported to Finland where more recently other feral looking sled type dogs have been added to improve the American Tamaskan. 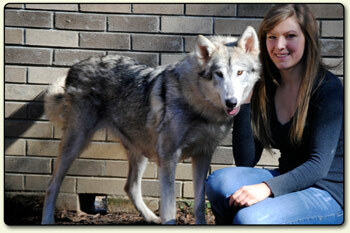 The purpose for the Tamaskan Breeder was to create a dog that looks like a feral in appearance with working ability. 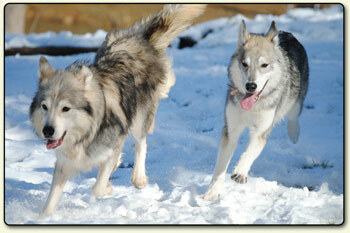 The first Tamaskan Puppies to be imported into America arrived in 2005 and they had their first litter in 2007. Since that time the Tamaskan popularity has grown and there are now a handful of registered breeders across North America. The country of origin is difficult to determine, Tamaskans were bred in Finland, Britain and America before the bloodlines were closed in 2006 which could mean that all three are the countries of origin. Currently no country has accepted the Tamaskan as a registered breed, although it is believed the Tamaskan may soon be recognized by the American AKC Foundation Stock Service (FSS), as well as recognition through other Clubs. American Tamaskans are large, athletic dogs; slightly taller in size than German Shepherds. With regards to build, they are substantially larger than their Siberian Husky ancestors but smaller than the Alaskan Malamute. They generally resemble grey Timber Wolves. On average, American Tamaskan adults measure around 24-28 inches tall at the shoulder and typically weigh between 55-88 pounds. the heaviest recorded Tamaskan males (to date) weigh just under 130 pounds. Females are usually slightly smaller and lighter than males, with a distinct feminine appearance. Males are more heavyset with broader heads and a heavier bone structure. Tamaskans have a lupine appearance with a straight bushy tail and thick double coat that comes in three main colors: Wolf Gray, Red Gray, and Black Gray. Each individual guard hair is agouti banded along its length. The almond-shaped eyes are yellow through amber and brown, with lighter colored eyes being very rare. Tamaskans are intelligent and have been known to excel in agility, obedience and working trials. They also make decent sled dogs and many Tamaskan living in colder climates regularly participate in recreational, and occasionally competitive, dogsled racing as well as skijoring. They could make good search and rescue dogs due to their keen sense of smell, stamina and endurance. Tamaskans can also be successfully trained as therapy or assistance dogs due to their friendly and laid-back personality. As a breed they tend to be social and are good with people, children, and other dogs, as well as other family pets (cats, chickens, rabbits, hamsters, parakeets, etc.). Tamaskans need company, and if left alone for long periods of time, they may become bored, which can lead to destructive behavior and/or escape attempts. Moreover, Tamaskans love to dig holes and can pull quite strongly on the leash; both traits they have inherited from their arctic heritage. However, unlike some of their husky ancestors, Tamaskans generally respond well off the leash and, with training, will return when called. Despite their ancestry, the hunting instinct is low, but they do retain the 'pack' dog behavior and crave company of either humans or other canines. As a working dog this behavior can also occur without proper stimulation. All working dogs need to have their brains and bodies exercised from time to time, and the Tamaskan is no exception. With regards to training, they are highly intelligent, but can be somewhat stubborn. Tamaskans have been known to excel in obedience, agility, sled pulling and musical freestyle, but their calm and laid back nature also makes them suitable as therapy dogs. 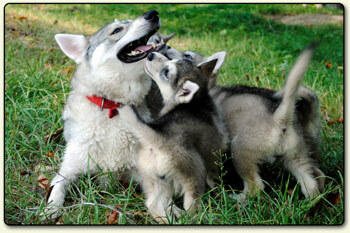 According to the Tamaskan official breed standard, the Tamaskan is friendly and affectionate. He should not appear aggressive or overly reserved towards people or other dogs. His high intelligence and eagerness to please make him versatile in his uses as a working dog and loyal companion. Indeed, Tamaskan Dogs love strangers and would more likely lick them to death than bite, so they would never make a good guard dog. Some Tamaskans, like other arctic breeds, will howl. This is a most beautiful sound, but generally not at 2:30 in the morning. Tamaskans are a rare breed especially with only a few registered breeders in the United States of America. The cost of importing a puppy is even more costly due to shipping prices. In either event, purchasing a Tamaskan is quite a financial commitment. 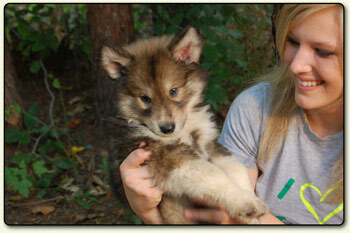 Therefore, before you put a buy a Tamaskan puppy, please make sure you are working with a reputable registered breeder. Registered breeders are listed on the Tamaskan Club of America (TCA) website. The TCA is the official registry of the American Tamaskan. Beware of backyard or hobby breeders; especially those from Elizabeth City North Carolina.